Pipe penetrating radar (PPR), the in-pipe application of ground penetrating radar (GPR) is one of the most promising quantitative pipe condition assessment technologies to emerge in recent years. With most of the underground pipe infrastructure reaching the end of their design life there is a need to provide measurable data in order to establish the extent of rehabilitation required or the timing of replacement for largediameter critical pipe lines. Although closed circuit television (CCTV) inspection methods are effective and widely available tools for identifying visible defects on the internal wall of pipes, CCTV cannot see behind the pipe’s inner surface, nor can it quantitatively determine the extent of corrosion. PPR technology allows the implementation of proactive preventative maintenance procedures for non-ferrous wastewater and water underground infrastructure. The combined application of PPR, CCTV and LIDAR (light detection and ranging) provides the most complete inspection technology to enable proactive asset management and allow utility owners to plan and schedule the inspection and rehabilitation of critical utilities prior to the occurrence of emergency scenarios. Ground penetrating radar (GPR) is the general term applied to techniques that employ radio waves to profile structures and features in the subsurface. Pipe penetrating radar (PPR) is the in-pipe application of GPR. The resolution of PPR technology is primarily determined by the wavelength, but is also affected by other factors such as polarization, dielectric contrast, signal attenuation, background noise, target geometry and target surface texture, all of which influence the reflected wave. Since the primary factor determining signal penetration is the conductivity of the soil, it is important to point out that PPR works where traditional “above ground” GPR does not. The SewerVUE Surveyor is the first commercially-available multi-sensor inspection robot that uses visual and quantitative technologies including CCTV, LIDAR and PPR to inspect underground pipes. 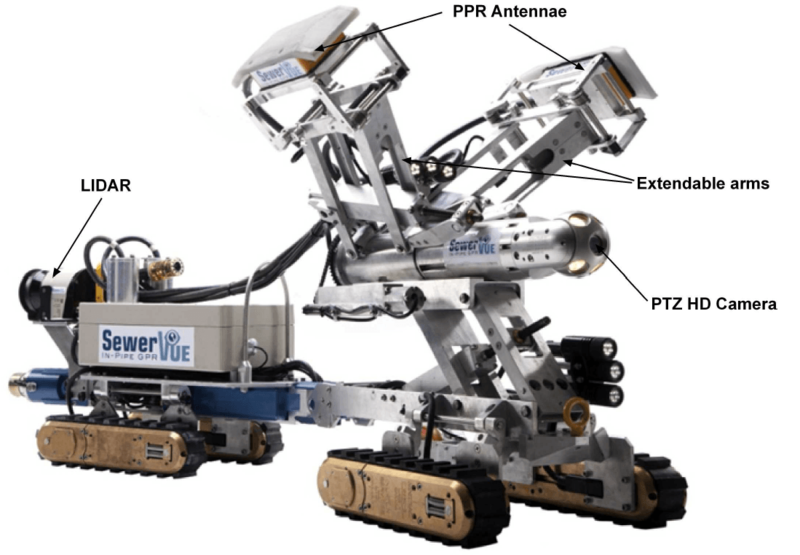 This fourth generation PPR pipe inspection system is mounted on a rubber tracked robot and equipped with two high-frequency PPR antennae. Radar data collection is obtained via two independent channels in both in and out directions, providing a continuous reading on pipe wall thickness and voids outside of the pipe. CCTV data is recorded simultaneously and is used for correlation with PPR data collection. The SewerVUE Surveyor is the first commercially-available inspection robot to use CCTV, LIDAR and PPR to inspect underground pipes. The robot has the capability to take quantitative measurements of the inside of the pipe. LIDAR technology employs a scanning laser to collect inside pipe geometric data which is then used to determine pipe wall variances from a manufactured pipe specification. LIDAR data is correlated with an onboard inertial navigation system that can accurately map the x, y, and z coordinates of the pipe without the need for external references. LIDAR and x, y, and z data collection was not part of the scope for this project. The SewerVUE Surveyor is equipped with three cameras (front, antenna and back). The City of Stockton Department of Municipal Utilities commissioned to conduct a high-frequency PPR survey to inspect sections of the Del Norte Trunk Sewer in Stockton, California. The Del Norte Trunk Sewer is a 36-inch reinforced concrete pipe (RCP) with a 0.7-inch thick fibreglass liner that reduced the inner diameter to approximately 32.5 inches. The total inspected length was 4,264 feet. The objective of the PPR survey was to determine the condition of the approximately 55-year-old lined RCP by mapping its wall thickness, rebar cover and detecting voids or other anomalies within or outside the pipe wall. The pipe experienced failures in the past and the fibreglass liner has at places also separated from the original RCP pipe wall. The 4,264 feet of PPR data from the Del Norte Trunk Sewer indicated sufficient rebar cover and no void type anomalies on any of the processed PPR profiles. Wall thickness including the grouted fibreglass liner was interpreted to be four inches with little variation over the inspected length. The system used in Stockton can be adjusted for 21 to 60-inch diameter pipes; the PPR antennae can be rotated between the nine and three o’clock positions. The second case study took place in a 120-inch-diameter brick lined sewer that was originally constructed in 1906. It is a combined sewer that, during intense rainfall events, fills to capacity and conveys flows to a deep tunnel system and can also convey overflows to receiving waters. The engineering firm tasked with the design of rehabilitation commissioned SewerVUE to perform a non-destructive condition assessment before determining repair locations and methods. The primary purpose of the condition assessment was to locate and identify voids that may exist behind the brick- lined pipe wall. A total 2,040 feet of the sewer was surveyed with a hand-held 1 GHz frequency PPR system. Signal penetration was between 20 and 40 inches deep, and the data was of high quality. The most prominent feature on all the profiles was the pattern change often accompanied with a near horizontal, wavy interface at 16 ± 4 inch. This feature was interpreted as the brick liner/backfill interface. The key advantage of PPR is the unique ability to map pipe wall thickness and deterioration including voids outside the pipe, enabling accurate predictability of needed rehabilitation or the timing of replacement. Examples from a robotic and a manned entry project were used to illustrate how PPR can map remaining pipe wall thickness, rebar cover, grout placement and voids outside the pipe. The robotic PPR case study that was conducted in Stockton, CA, in a 36-inch reinforced concrete pipe with a 0.7-inch thick fibreglass liner confirmed four inches of remaining wall thickness including the grouted fibreglass liner with little variation over the inspected length. Rebar cover appeared to be sufficient with no void type anomalies outside the pipe. data from a 109-year-old, 120-inch-diameter brick-lined sewer revealed voids both outside and within the pipe wall and thus provided engineers the information needed to take the appropriate approach to rehabilitate the pipe. With limited available funding and budget constraints becoming more prevalent, timing of rehabilitation and overall intelligent asset management is more critical than ever for municipalities. Advanced pipe condition assessment technologies, including the SewerVUE PPR system, are demonstrated to be costeffective, non-destructive methods that are able to help better refine structural conditions and estimated remaining life of a pipeline asset. They accurately determine overall severity of pipe degradation as well as provide a basis for improved cost allocation and timing of rehabilitation efforts.